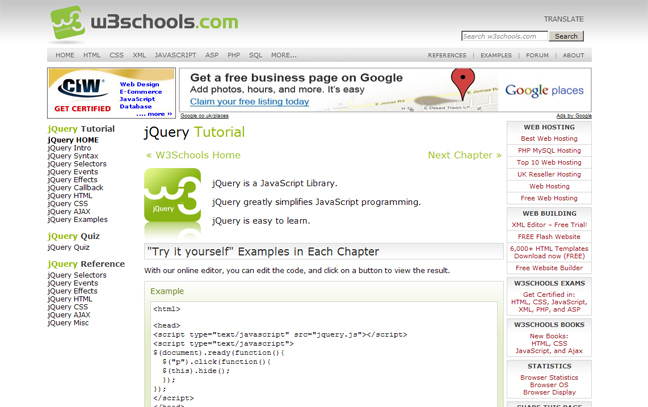 If you are unfamiliar with any of these, I suggest looking at the W3Schools website for more information. Their resources explain everything very clearly and provide great working examples. 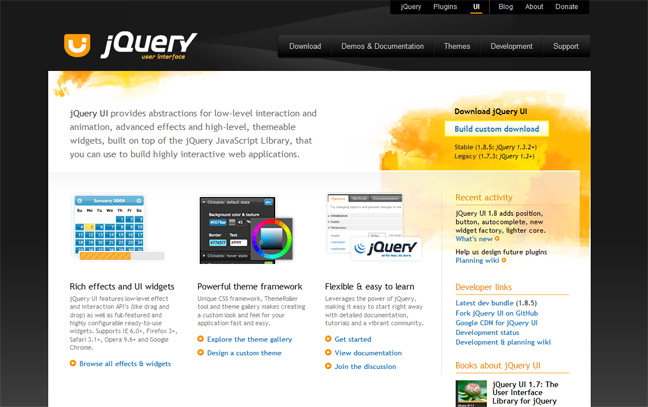 Currently jQuery is all the rage and there is no shortage of great resources on-line. 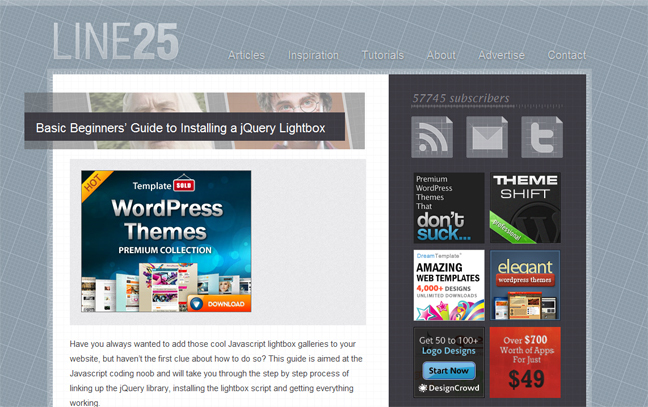 Below I have included a few which I feel those new to jQuery should be aware of. 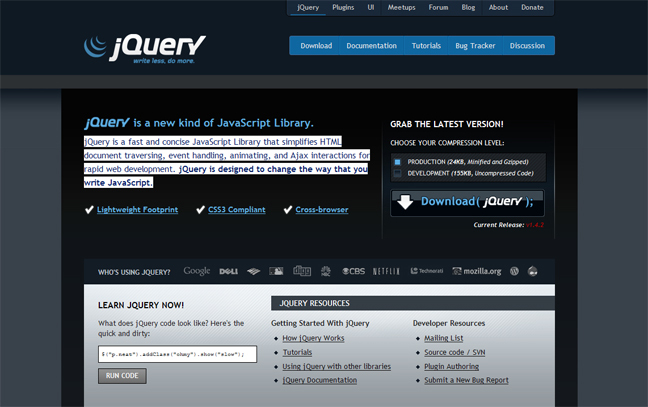 Let’s start with jQuery.com – here you can download the full version of jQuery, including previous versions. There is lots of information and documentation to keep you on the right track. Plus there are tutorials and plenty of ready-to-use User Interface (UI) widgets and effects provided. And here is were you can download those great ready-to-use widgets and effects to bring your User Interface to life. I have already mentioned W3Schools in this post, but I truly can not emphasize how well this website explains everything. Plus the working examples are a great way to help you understand the code and tweak it to create your own effects. 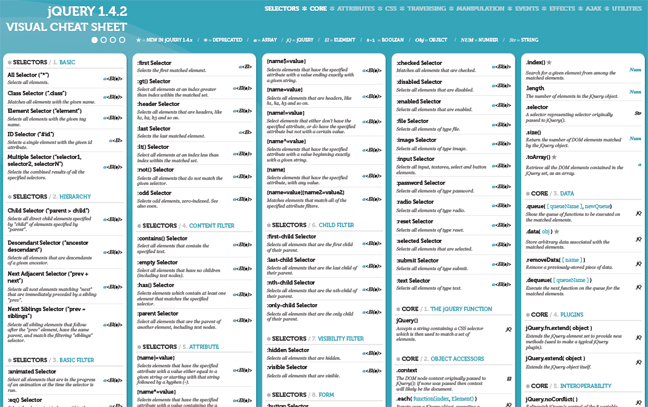 At the time of this post going live, the latest stable version of jQuery is 1.4.2 – so if you happen to be using jQuery 1.4.2 this cheat sheet is a great visual aid to help you remember all the different attributes, effects, animations and much more! 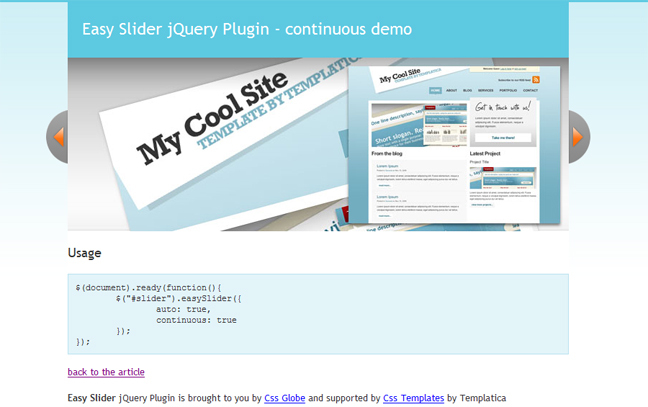 There are plenty of jQuery tutorials and examples on-line, including lots of ready-to-use effects and widgets. Below are some examples that I believe will help a beginner to jQuery quickly create some stunning effects which will really add the ‘wow’ factor to any website project. I would be surprised if you have not come across FancyBox in use while surfing the internet. This jQuery script is a great way to show a gallery of images, both as thumbnails and as larger images, in a clean and simple manner. 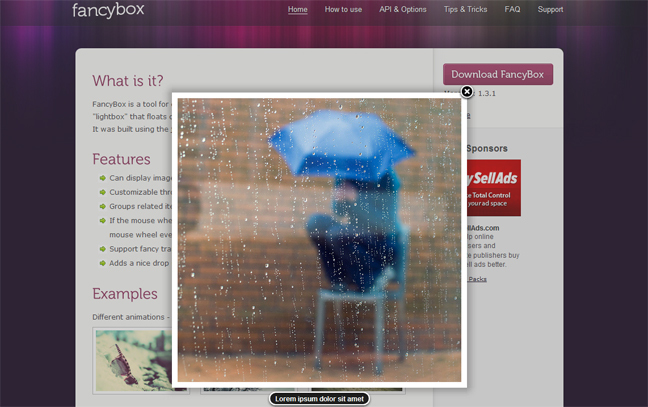 FancyBox also allows you to add captions and previous and next navigation to the ‘floating lightbox’ style image. I truly recommend visiting the website to see this script in action! In this step-by-step tutorial on Line25, Chris Spooner shows you, from start to finish, how to had a jQuery lightbox script to your website gallery. 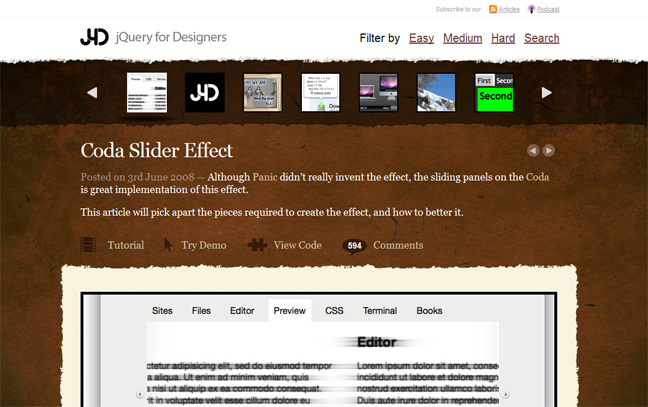 In his tutorial, Chris recommends using the lightbox script from http://leandrovieira.com/projects/jquery/lightbox/. 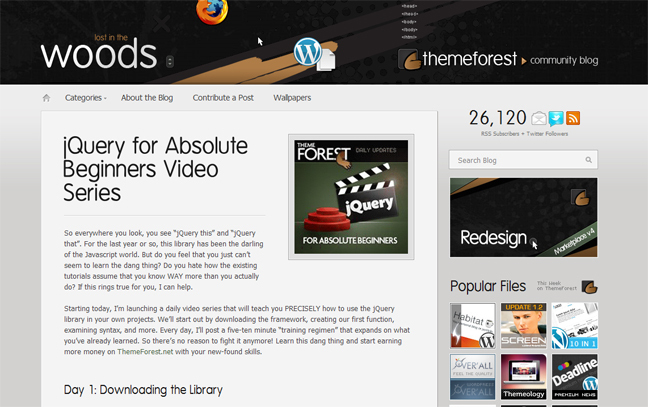 If you are the type who prefers to watch video tutorials, then this series from ThemeForest, Lost in the Woods is just the thing you are looking for. This video series is aimed at absolute beginners to jQuery and takes you through everything from downloading the script from jQuery.com, to more advanced techniques such as jQuery’s Ajax capabilities and submitting information to a database. This great script from jQuery For Designers gives you a neat away to display lots of information on a website without using a lot of visual space – a great way to keep information above the ‘fold’. Don’t forget to check out the other tutorials on the site while you’re there! This script is quite similar to the Coda Slider Effect script above, however this script also includes an auto-play functionality so that the animation starts as soon as the page has finished loading. Once you have gone through and understood the resources above, you will be well-on-your-way to becoming a proficient jQuery user; with the ability to edit existing code to suit your needs or write your own code from scratch. Are you new to jQuery? What are your thoughts regarding the resources provided above? Or have you used jQuery before? Can you recommend tutorials, examples and resources that will be of great help to others? Hi thanks Ivan. I really hope this information helps you get started with jQuery. I will be adding links to Digg and such in the near future. Many thanks for you comment. Your very welcome Nayan – glad you liked it. I’ll produce some more posts like this in the near future. Thanks for your comment. Hi Rauna, thanks and your welcome =D Yeah I love jQuery too, its so flexible. Thanks for your comment.